On 26 December 2016 Dutch newspaper De Volkskrant reported on our investigation of the alleged Hitler watercolor owned by NIOD. NIOD had claimed on November 25 2017, that this watercolor was "almost certainly an original" and "As far as we know we're the only heritage institute in the Netherlands possessing a Hitler painting." Dutch news agency ANP published a report on the Volkskrant-article; it appeared in most Dutch media. As ANP is associated with the international news agency AFP, very soon translations in Chinese, Czech, English, French, German, Hungarian, Japanese, Portuguese, Rumenian, Slovenian and Spanish followed. Unfortunately the translators who worked on the French, German and Spanish versions introduced fantasy in their articles, claiming that we -Van den Born and Droog - had studied the pencil strokes on the NIOD watercolor, and concluded that it was almost certainly not painted by Hitler but possibly by Reinhold Hanisch, the first known 'Hitler' forger. Well: we did not study the pencil strokes, and even if we had, we could not have concluded anything based on it, by lack of reliable comparison material. We don't know who painted the NIOD watercolor. There's no direct evidence linking this work to a particular painter. We also did not comment on the quality of the NIOD-watercolor attributed to Hitler. ANP/Nu.nl. Experts twijfelen aan authenticiteit van Hitler-aquarel dat NIOD kreeg. Nu.nl, 26/27-12-2017. Twijfels over authenticiteit 'Hitler-aquarel'. De Telegraaf, 26-12-2017. ANP/Casper Naber. 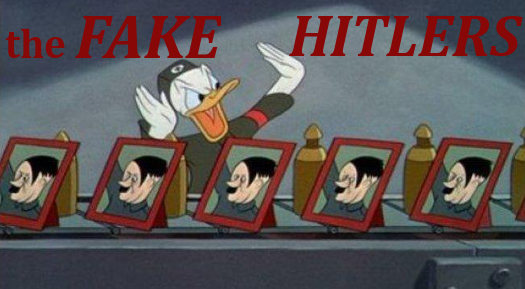 Twijfels over echtheid 'Hitler-aquarel'. AD, 26-12-2017. 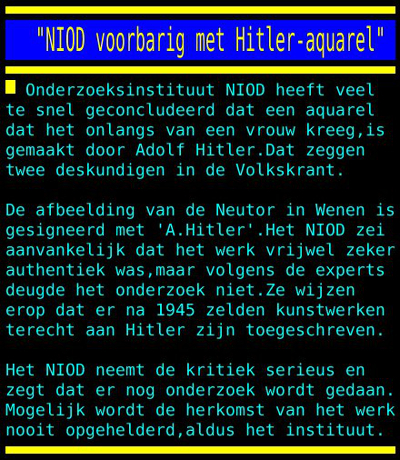 'NIOD maakt flater met aquarel Adolf Hitler'. Jonet.nl, 27-12-2017. AFP. Dutch experts doubt authenticity of rare 'Hitler' painting. News Yahoo.com [Australia], 27-12-2017. AFP. Dutch experts doubt authenticity of rare 'Hitler' painting. Expatica, 27-12-2017. EFE. Investigadores holandeses dudan de autenticidad acuarela atribuida a Hitler. El Espectador (Colombia), 27-12-2017. AFP - Pays-Bas : l'authenticité d'une aquarelle signée Hitler remise en cause. The Times of Israel, 27-12-2017. French version. MadreMedia/AFP. Há mais uma falsa aguarela de Hitler, dizem investigadores holandeses. Sapo24 [Portugal], 27-12-2017. L'aquarelle signée Hitler est-elle vraie? Tribune de Genève (Switzerland), 27-12-2017. "Falscher Hitler": Forscher bezweifeln Echtheit von Aquarell. Salzburger Nachrichten, 27-12-2017. Hitlerem signovaná kresba je asi padělek, zjistili dva nizozemští vědci. Deník.cz (Tsjechië), 27-12-2017. Belga. L'authenticité d'une aquarelle signée Hitler remise en cause. 7sur7 (Belgium), 27-12-2017. Forscher bezweifeln Echtheit von Hitler-Aquarell. ORF News (Vienna), 27-12-2017. O acuarelă "mediocră" ,care ar fi semnată de Adolf Hitler, ar fi opera unui falsificator. Black News (Rumenia). [27-12-2017]. L'aquarelle signée Hitler est-elle vraie? 24 Heures (Switzerland), 27-12-2017. AFP - L’authenticité d’une aquarelle signée Hitler remise en cause. Le Soleil (Quebec, Canada), 27-12-2017. Expertos cuestionan autenticidad de acuarela pintada por Hitler. Bajo Palabra (Mexico), 27-12-2017. Dutch Experts Doubt Authenticity Of Rare Adolf Hitler Watercolour Painting. USA Art News, 28-12-2017. Forscher bezweifeln Echtheit von Hitler-Aquarell. Deutschlandfunk, 28-12-2017. Eric Nederkoorn. Stijgende verbazing over 'authentieke' aquarel van Hitler. Dagblad van het Noorden, 28-12-2017. AFP. Niederländische Forscher bezweifeln Echtheit von angeblichem Aquarell Hitlers. Die Zeit, 28-12-2017. Hitler képe hamisítvány, de eladják a szuper Mercedest. 24.hu [Hongarije], 28-12-2017. Niederländische Forscher bezweifeln Echtheit von angeblichem Hitler-Aquarell. "Hässliche" Bildqualität. Focus (Germany), 28-12-2017. ANP. Twijfels over authenticiteit van 'Hitler-aquarel'. Nederlands Dagblad, 28-12-2017. AFP. Experto holandeses cuestionan autenticidad de acuarela pintado por Hitler. La Prensa/Mundo [Panama], 28-12-2017. Nizozemskemu inštitutu podarjeni Hitlerjev akvarel zgolj ponaredek? Akvarel z motivom stolpa na Dunaju. RTV Slovenjia (Slovenia), 28-12-2017. Dutch experts doubt authenticity of rare 'Adolf Hitler' watercolour painting. Artdaily.com [Spain], 28-12-2017. L'authenticité d'une aquarelle signée Adolf Hitler remise en cause. Le Figaro, 29-12-2017. Benjamin Sutton. Art Movements. [Researchers in the Netherlands suspect that a rare watercolor purportedly painted by Adolf Hitler is in fact a forgery. An anonymous donor gifted the work to the Netherlands Institute for War Documentation in November]. Hyperallergic.com, [New York], 29-12-2017. Cuestionada la autenticidad de acuarela de Hitler donada a NIOD. Homines.com [Malaga, Spain], 29-12-2017. Mark Boninsegna. Dichters Droog en Van den Born op Hitlerjacht. A Fetish for Poetry, [Rotterdam], 31-12-2017.